Books can be ordered directly from us for the standard price of $24.95. Postage is $5 for Australia, and takes just a few days. Life at the Palace is a necklace of anecdotes about the funny, sometimes sad things that happened on the way to finding a roof for their sizeable family in the ‘big smoke’. And thus began ten years of eccentric living in a 36 room, waterfront mansion on Sydney harbour, complete with double boat sheds, a wharf, a ballroom and a cast of characters as unlikely as the Queen’s cousin, Lord Patrick Litchfield and Peter Bell – a PhD student studying the life cycle of a platypus. This second volume of Joy Jobbins’ memoirs takes readers on a very rocky journey from a two room, M-roofed country cottage to a multi-million dollar harbour side mansion and other ‘digs’ along the way. It covers the ups and downs of the life of a working mother of five, juggling the demands of work, children and marriage and reflects the vibrant, swinging years of Sydney in the 60s and 70s. Told with verve and enlivened by interjections from family and friends, it includes Joy’s creation of a pioneering TV show called Cooking with Sheri and the ill-fated publication of Australia’s first travel magazine, Australia for Players and Stayers. This is a buckle up and hold on ride which inspires the reader to live life to the fullest. It is a necklace of anecdotes describing that very rocky journey from the tiny country cottage to a multi-million dollar harbour side mansion. 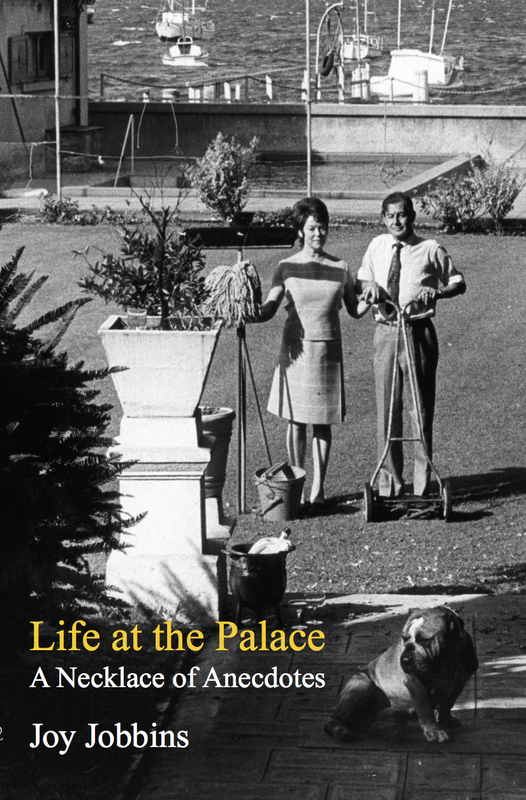 Published for her 90th birthday, Life at the Palace remembers those earlier years, and a few post-palace stories that followed. This memoir is only the second in her trilogy. Already she’s working on her next story – The Saga of the Sea Snake Skins which she expects to publish for her 100th birthday in 2017.